August 14th, 2016 - Huntington Beach, CA. An event of survival, endurance and bravery… There will be only one true Waterman. 10 x Molokai champion, big wave charger, and paddboarding legend Jamie Mitchell brings a new, innovative concept to ocean racing. An exciting and original format for both competitors and spectators, the 2016 Quiksilver Watermans Festival is like no other event. Challenge yourself with a relentless survivor race or push your limits in the One Mile SUP course. Off the board, sign up for a range of challenging swim courses or enter the Dash for Cash and race back to the sand for some fun. The 2016 Quiksilver Waterman’s festival is designed to suit all levels of competitor. Kelly Slater describes Jamie as “one of the greatest unknown sportsmen of all time. Ten years he has won the Molokai channel paddle race … his winning percentage is higher than anyone in any sport ever”. Jamie is a world champion ocean paddler, big wave rider, and international swell chaser. If it’s a wave-riding craft, Jamie will be on it – from tow-in to standup paddle boards to foil boards, canoe surfing and shortboards. He’s the definition of a waterman. At the top of Jamie’s long list of achievements sits his ten consecutive wins of the Molokai to Oahu Paddleboard World Championships. Raced over 32 gruelling miles, competitors battle surging swells, scorching sun, high winds, and some of the strongest currents on the planet. To finish this event is an epic achievement in itself. To dominate is incredible. 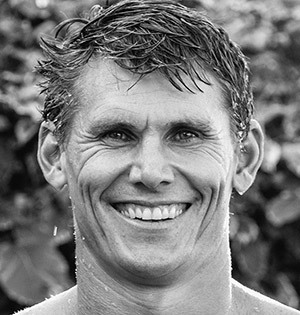 Since 2002, Jamie has won virtually every major paddleboard race he has entered. A big wave surfer, Jamie has also competed in numerous big wave riding events riding in Todos Santos in Mexico, Belharra in France, and Mavericks in the US, or wherever there is huge swell.